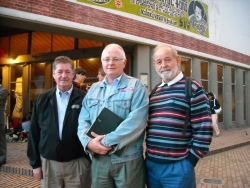 CCFTA among a host of initiatives that create "huge opportunities for easy profits"
Proponents of the the Canada-Colombia Free Trade Agreement (Bill C-23) faced a few hurdles over the past few weeks, but the deal is far from dead. Bill C-23 is on the order paper for October 19th, when Parliament resumes after fall recess. The deal has undergone eight days of debate in Parliament, most recently as subject to an NDP sub-amendment to a Bloc amendement to the bill. The NDP's sub-amendment was meant to "stop the FTA from going to second reading, essentially killing the agreement," according to Stuart Trew, trade campaigner for the Council of Canadians. The sub-amendment was jettisoned by the Liberals and the Conservatives (74 in favor, 194 against). Next stop is for the Tories and the Grits to tackle the Bloc's amendment to the Bill, which according to activists tracking progress of the deal "will 'flush' out the positions of Liberals on C-23." » continue reading "Canada-Colombia FTA on life support, but still breathing"
Reports from Ottawa are that the Conservatives have notched the Canada-Colombia Free Trade Agreement down on the order paper. The deal, enshrined in Bill C-23, was expected to go to a vote after a second reading. 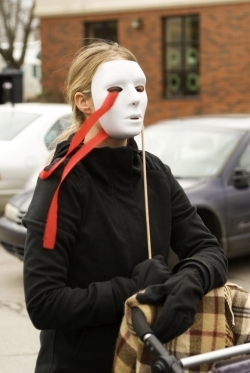 The second reading, or at least part of it, took place last week. The vote didn't. Here, I reproduce part of a message sent out from NDP Foreign Affairs critic Peter Julian on Friday. This is our second victory, I guess it means that we’ve won the second round of the debate but there is no doubt that this Bill will be coming back, potentially in a few weeks time, while the House sits awaiting a pending election. I think that we should celebrate another victory at a time when the government thought, with Liberal support, it could push it rapidly through within a couple of days. I reported last week that some Liberals are now in support of the deal, but others, obviously, are less sure. MP Jay Hill indicated Friday that Bill C-23 is no longer at the top of the Conservatives' list, but has been bumped down a notch behind the National Capital Act, which he expects to table after MPs return from constituency break. I guess the phone calls and petitions are having some effect. Photo of MP Scott Brison, Canada-Colombia FTA booster par excellence. He spent 96 hours in Colombia in August. Urgent! Tell the Libs that We Say No to the Canada-Colombia FTA! Received some notes from a CPAC observer today who said that some Liberals are speaking out againt the Canada-Colombia FTA. This afternoon, he sent a message reading "Ok, they're in adjournment proceedings. Somehow, we got through another day of debate in parliament without a vote. Let's get on those phones, folks." The call is out again, urgently, for people to call Liberal MPs and ask them NOT to speak out against the Canada-Colombia FTA. Below, I re-paste a previous post on this issue, including phone numbers of strategic Liberals. The time to call is now. Below is contact info for the Liberal leader, some influential Liberal MPs, Liberal members of the trade committee, and some Liberal MPs who narrowly won their ridings in the last election. Please send them messages urging them to oppose the CCFTA. Ask your friends and faimly to do likewise. » continue reading "Urgent! Tell the Libs that We Say No to the Canada-Colombia FTA!" According to an email from Bob Rae about the Canada Colombia FTA, the Grits "will be supportive of the bill proceeding to committee." The legislative information about the CCFTA (Bill C-23) has yet to be updated online. So no word yet as to how that went. Thank you for your message about the House of Commons debate on the ratification of the Canada-Colombia free trade agreement, with its side agreements on labour and the environment, together with an understanding on investment and taxation. If there is no election, as a result of a decision by either the Bloc or the NDP to support the Harper government, it is indeed likely that this bill will go to committee, where there will be substantial discussions on the impact of the treaty. The Liberal Party will be supportive of the bill proceeding to committee. Further support will depend on satisfactory answers to our questions and concerns. I had the opportunity to travel to Colombia recently, and met with business and trade union leaders, as well as leaders of non-governmental organizations and of course the Colombian government itself. I feel better informed about the situation, but am determined to listen and learn during the debate. 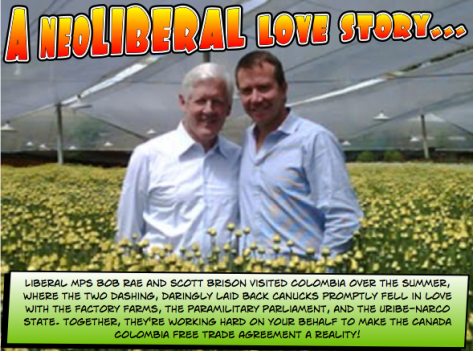 » continue reading "Bob Rae: Liberals "will support" Canada Colombia Free Trade Agreement"
Bill C-23, the Act to implement the Free Trade Agreement between Canada and the Republic of Colombia, is on the Order Paper for September 14th. Below, a call to action from the folks managing the Stop the Canada Colombia FTA group on Facebook. I know I just wrote a blog post on how lame it feels to write letters, but in the interim, ¡vamónos! We have learned that the Canada-Colombia Free Trade Agreement is to be the first order of business when the House of Commons reconvenes on Monday. There are strong indications that the Liberal Party are intending to support the bill. We managed to back them off once before - we need to do so again. 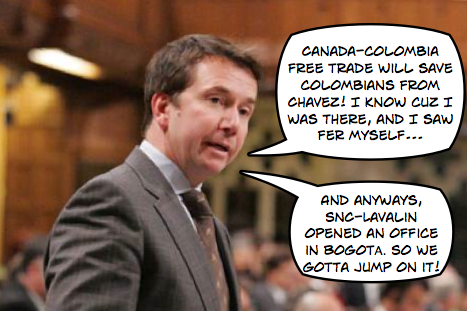 » continue reading "Tories set to re-introduce Canada Colombia Free Trade Agreement"
"There is a view in some groups that they don't like modern economic policy. They think you can make progress without it. 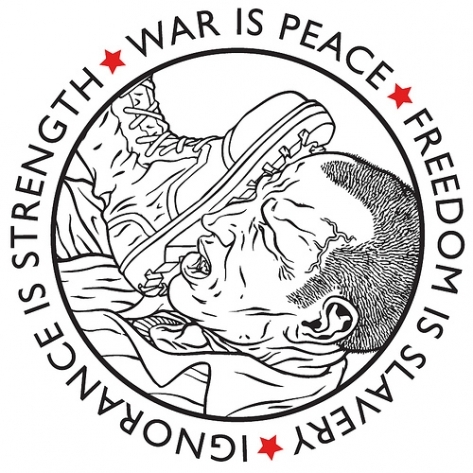 They're entitled to their view," said Harper while in Trinidad and Tobago for the the Summit of the Americas. 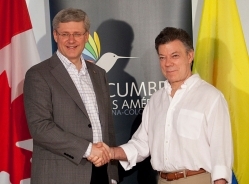 » continue reading "Harper pushes the Canada-Colombia FTA, the people fight back"
The Canada Colombia Free Trade Agreement was introduced to parliament on March 26th by the Conservative Government. It will sit until it is tabled, likely after the Easter recess, after which time it will sit for 21 days before ratification (or defeat). The Canadian Council for International Cooperation released an exhaustive investigation into the trade deal on the day it was tabled. For their part, the Conservatives have gotten so desperate to sell the deal that they're not even talking about human rights for Colombians anymore. Now it's about jobs for Canadians. It's a cool day in Bogotá, but the rains that have plagued the country over the last month have abated, at least momentarily. I met with Mario Valencia from RECALCA (Colombian Network for Action on Free Trade) this morning. Top of mind for him was the possibility that Harper's Conservatives are dethroned on December 8, which would likely mean that the FTA is shelved, at least for the time being. Though I'm personally skeptical about the possibility of a coalition actually succeeding in taking power from the Conservatives, in my experience it's rare that something happening in Canadian politics actually interests folks outside the country. The consequences [of a Canada-Colombia Free Trade Agreement] are evident: 80% of what Colombia sells to Canada consists of coffee, coal, flowers and sugar, which is to say goods that do not require an agreement to get to the market. On the other hand, 23% of what [Colombia] buys from Canada are agricultural products, principally cereals and meat products, which will worsen the situation of national producers. 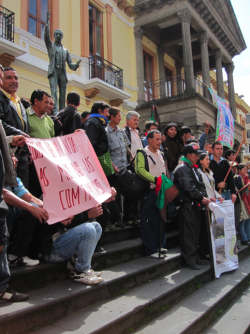 The FTA [between Colombia and] Canada seems to have been written by a mining company. Canada is known as a paradise for these types of corporation, like Colombia Goldfields Ltd, Coalcorp Mining Inc, and Frontier Pacific Mining Corporation, whose environmental impact is already well known. » continue reading "Notes from Bogotá: Update on the Canada - Colombia FTA"
Stéphane Dion spoke this evening to a crowd of over 400 students at the University of British Columbia. During the question period, I asked him if he would support a Free Trade Agreement between Canada and Colombia. "The question was about, uh, if we will accept a Free Trade Agreement with Colombia. The way it was negotiated by the Conservatives we have no guarantee at all that the basic rights will be respected through this agreement, the workers rights, and so on. It [sic] is why we can not accept it." 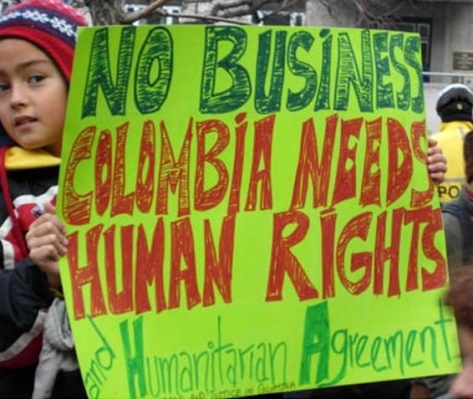 The Report of the Standing Committee on International Trade, "Human Rights, the Environment and Free Trade with Colombia," is a hastily written document based on the Committee's work around the Canada Colombia Free Trade Agreement. The report in itself is not great, but the recommendations are important. It will be key for Canadians to pressure the Harper government to abide by the recommendations, which are an obstacle to the signing of the FTA, but which the Conservatives are likely to try and bypass. The recommendations are reproduced below. Meanwhile, the scandals continue to pile up for the Uribe regime. See: Declaration of Carlos Gaviria (PDA) on Uribe's declaration of a 'Populist Dictatorship,'. UPDATE: Justin Podur on the release of Ingrid Betancourt. » continue reading "Standing Committee Report on Canada - Colombia FTA"
Canada - Colombia FTA: ¡Viva la Muerte! On June 7th, Foreign Affairs Canada announced that the negotiations for the Canada-Colombia free trade agreement have been concluded. The entire negotiation process has been secret and there is no public draft text of the agreement to speak of. According to FAC, "Before signing the agreements and making them public, Canada and Colombia will undertake a detailed legal review of the texts in English, French and Spanish. In Canada, the treaties will then be tabled in the House of Commons for a period of 21 sitting days. During that time, members of parliament will be able to review, debate, vote on a motion, or send the agreements to committee for further review. 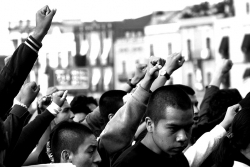 Following the 21-day period, the Government plans to introduce draft legislation to implement the agreements." 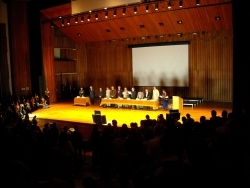 Both countries are playing up the labour and environmental agreements that accompany the FTA, this at a time when the legitimacy of the Colombian Congress is questionable due to ongoing scandals, and the Canadian Liberal party is charging that the FTA was announced with "no respect for parliament." While the Democrat controlled congress in the US has managed to block the ratification of the US-Colombia FTA, there is no such mechanism in Canada, and according to NDP MP Peter Julian, "Canada is pushing ahead with a trade agreement simply to satisfy George Bush and that is entirely inappropriate." 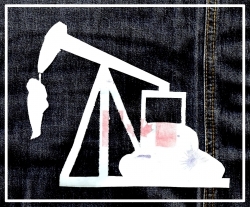 » continue reading "Canada - Colombia FTA: ¡Viva la Muerte!" FTA Canada-Colombia: days before the ink dries? South American news agencies are reporting that the Free Trade Agreement between Canada and Colombia could be signed this week in Bogotá. A Canadian "technical team" is participating in the 5th -and potentially final- round of negotiations in Bogotá from 1-6 June. Bloomberg quoted U of T political "scientist" John Kirton as saying: "An agreement 'will give aid and comfort to all the liberalizing forces within the United States who are instantly going to notice it and say if the Canadians are doing Colombia, why can't we.'" An excellent background article, "Building its Ties to Colombia: Canada's Imperial Adventure in the Andes," explains some of the major problems related to a Canada-Colombia FTA. 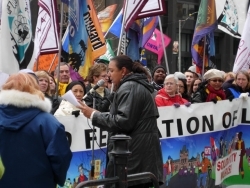 Photo from No Colombia FTA rally in Toronto in November, 2007.